Fullerton Hospital in the historic downtown district. For a property to qualify, it must generally be at least fifty years old and retain a high degree of historic integrity. Examples of properties not usually considered for listing are reconstructed buildings, moved properties, birthplaces, and graves, although exceptions may be made. 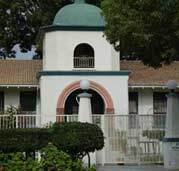 If you would like to know what Local Landmark designation confers to a property, please contact Fullerton Heritage, the Community Development Department of the City of Fullerton, and/or other Local Landmark property owners. Initial research on a property in Fullerton can be conducted in the Launer Local History Room of the Fullerton Public Library. The Fullerton Heritage website includes a current list of Fullerton SignificantProperties, an architectural history of notable buildings and neighborhoods titled Fullerton through theYears, and Design Guidelines for Residential Preservation Zones.